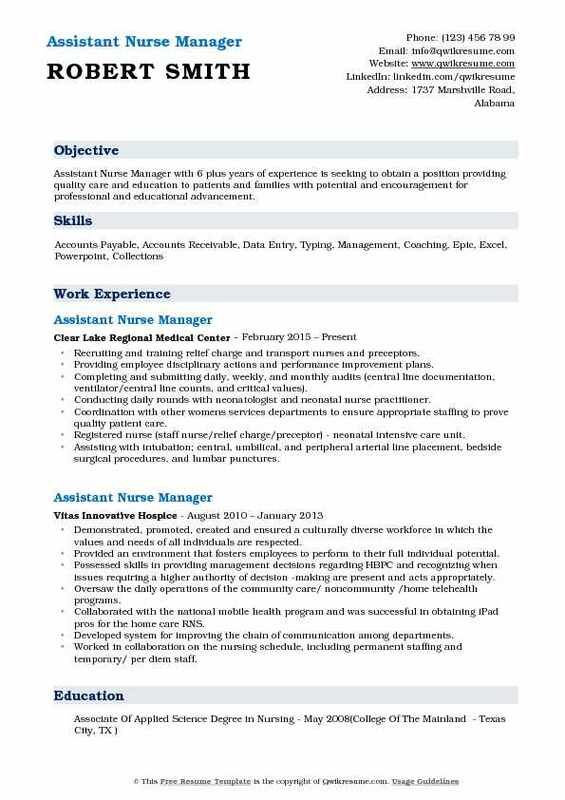 Assistant Nurse Manager renders operational and administrative support to the Nurse Managers. 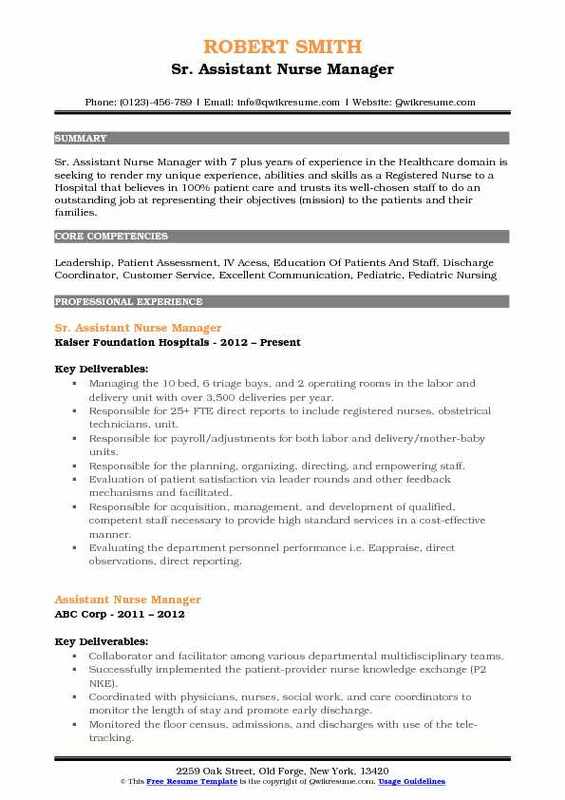 A refined Assistant Nurse Manager Resume incorporates such roles and responsibilities as – training and recruiting staffs, assisting head nurse in facilitating and coordinating patient care services, assessing performance, planning and scheduling work for nursing staffs, ensuring nurse staff abide by the hospital policies and procedures, monitoring performance of nursing staff and providing feedback, scheduling orientation and educational program for the newly hired and working with head nurse to determine staff requirements. While applying for this job position, assistant nurse managers are expected to highlight in their resumes qualifications like supervisory skills, teamwork, leadership, and organizational skills. Even though the exact education requirement may vary, an assistant nurse manager is expected to have at least a degree in the field of nursing with several years of experience in post-graduate nursing. 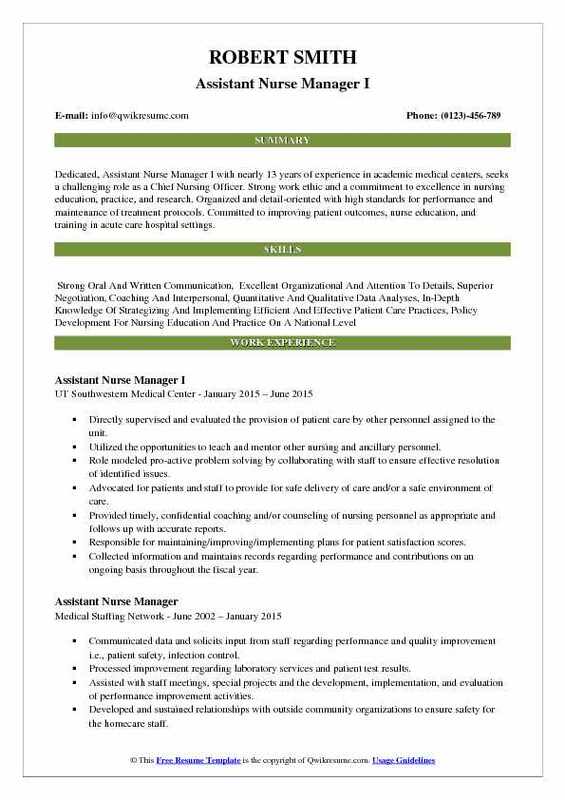 Summary : Assistant Nurse Manager II with 17 years of experience is in the Healthcare domain is seeking a position as a Registered Nurse with a company looking for someone with my experience, skills, and job knowledge. Organized the staff schedule. Spearheaded and resolved many scheduling issues by developing schedule tools, improving the performance of the system and communication regarding the schedule. Responsible for 30 RN annual evaluations-including writing the evaluation and meeting with the RN. Organized/participated in quality projects and chart audits to meet unit metrics/core measures. Epic resource use for the stork, postpartum, and newborn, and continue to resolve EMR issues. Trained/organized/coordinated staff in quality and practice projects and annual skills day to improve staff performance. Developed orientation organization tools to monitor the orientation process. Epic designer, OB subject matter expert, and credentialed trainer for stork, postpartum and newborn nursery. Informatics/documentation committee representative and spearheaded, resolved, removed impediments for many documentation issues with the EMR. 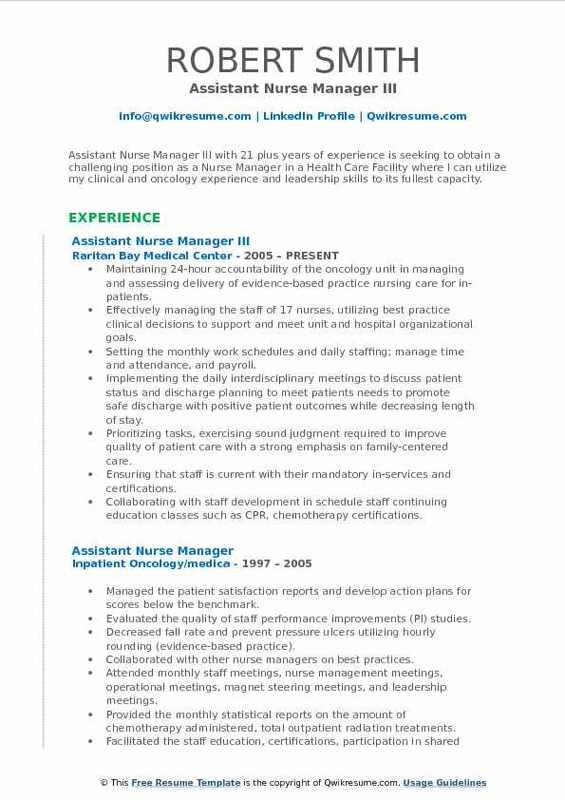 Summary : Energetic and enthusiastic Assistant Nurse Manager III with 20 years of compassionate caring. Responsible nurse with excellent communication and customer service skills demonstrated by letters from physicians and staff. Coached charge nurses by providing thorough supervision for day-to-day operations. Collaborated with staff nurses to develop the program that standardized employee training. Carefully selected, developed and retained qualified staff for 2 new small emergency departments and main emergency department. Rolled out the new system for tracking phones. Managed team of 100 nurses and over 50 ancillary staff. Planned and executed special events in the community with first aid stations. Worked closely with various sales representatives to identify new products and provide demonstrations for staff. Managed stock clerks - including stocking and rotating inventory regularly, obtaining quotes, and researching items. Managed point of care testing lab - ensuring control tests were done and. Ensured adequate supply of troponin cartridges. Developed and maintained positive customer, employee and co-worker relationships through effective communication. Assisted with training numerous new employees, including scheduling, testing, simulation, and their educational day. Summary : Dedicated, Assistant Nurse Manager I with nearly 13 years of experience in academic medical centers, seeks a challenging role as a Chief Nursing Officer. Strong work ethic and a commitment to excellence in nursing education, practice, and research. Organized and detail-oriented with high standards for performance and maintenance of treatment protocols. Committed to improving patient outcomes, nurse education, and training in acute care hospital settings. Directly supervised and evaluated the provision of patient care by other personnel assigned to the unit. Utilized the opportunities to teach and mentor other nursing and ancillary personnel. Role modeled pro-active problem solving by collaborating with staff to ensure effective resolution of identified issues. Advocated for patients and staff to provide for safe delivery of care and/or a safe environment of care. Provided timely, confidential coaching and/or counseling of nursing personnel as appropriate and follows up with accurate reports. Collected information and maintains records regarding performance and contributions on an ongoing basis throughout the fiscal year. Coordinated self-scheduling to maintain appropriate coverage for unit needs. Summary : Assistant Nurse Manager III with 21 plus years of experience is seeking to obtain a challenging position as a Nurse Manager in a Health Care Facility where I can utilize my clinical and oncology experience and leadership skills to its fullest capacity. Maintaining 24-hour accountability of the oncology unit in managing and assessing delivery of evidence-based practice nursing care for in-patients. Effectively managing the staff of 17 nurses, utilizing best practice clinical decisions to support and meet unit and hospital organizational goals. Setting the monthly work schedules and daily staffing; manage time and attendance, and payroll. Implementing the daily interdisciplinary meetings to discuss patient status and discharge planning to meet patients needs to promote safe discharge with positive patient outcomes while decreasing length of stay. Prioritizing tasks, exercising sound judgment required to improve quality of patient care with a strong emphasis on family-centered care. Ensuring that staff is current with their mandatory in-services and certifications. Collaborating with staff development in schedule staff continuing education classes such as CPR, chemotherapy certifications. Increasing the patient satisfaction scores on pain management (above benchmark), "patient pain well controlled" ranked in the 99 percentile. 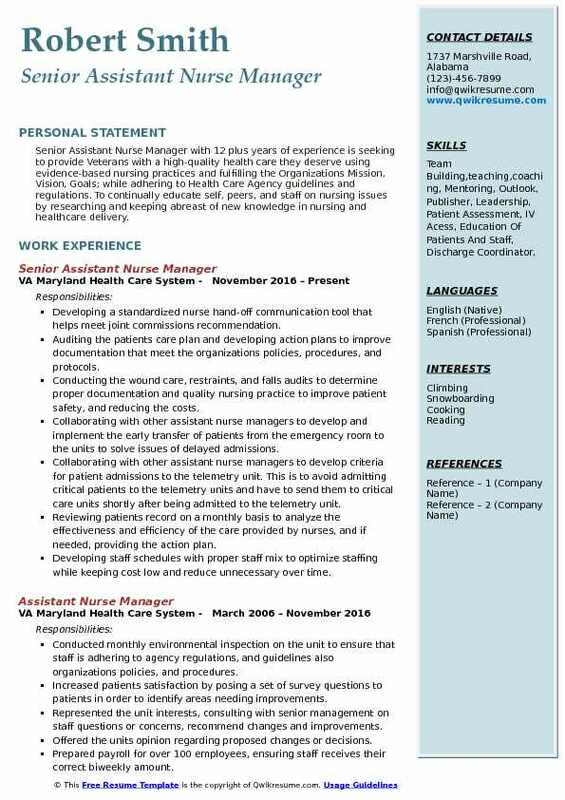 Summary : Senior Assistant Nurse Manager with 12 plus years of experience is seeking to provide Veterans with a high-quality health care they deserve using evidence-based nursing practices and fulfilling the Organizations Mission, Vision, Goals; while adhering to Health Care Agency guidelines and regulations. To continually educate self, peers, and staff on nursing issues by researching and keeping abreast of new knowledge in nursing and healthcare delivery. Developing a standardized nurse hand-off communication tool that helps meet joint commissions recommendation. Auditing the patients care plan and developing action plans to improve documentation that meet the organizations policies, procedures, and protocols. Conducting the wound care, restraints, and falls audits to determine proper documentation and quality nursing practice to improve patient safety, and reducing the costs. Collaborating with other assistant nurse managers to develop and implement the early transfer of patients from the emergency room to the units to solve issues of delayed admissions. Collaborating with other assistant nurse managers to develop criteria for patient admissions to the telemetry unit. This is to avoid admitting critical patients to the telemetry units and have to send them to critical care units shortly after being admitted to the telemetry unit. Reviewing patients record on a monthly basis to analyze the effectiveness and efficiency of the care provided by nurses, and if needed, providing the action plan. Developing staff schedules with proper staff mix to optimize staffing while keeping cost low and reduce unnecessary over time. Conducting monthly staff meetings to inform, educate, and remind staff of new agency regulations. Headline : Assistant Nurse Manager with 6 plus years of experience is seeking to obtain a position providing quality care and education to patients and families with potential and encouragement for professional and educational advancement. Recruiting and training relief charge and transport nurses and preceptors. Providing employee disciplinary actions and performance improvement plans. Completing and submitting daily, weekly, and monthly audits (central line documentation, ventilator/central line counts, and critical values). Conducting daily rounds with neonatologist and neonatal nurse practitioner. Coordination with other women's services departments to ensure appropriate staffing to prove quality patient care. Registered nurse (staff nurse/relief charge/preceptor) - neonatal intensive care unit. Assisting with intubation; central, umbilical, and peripheral arterial line placement, bedside surgical procedures, and lumbar punctures. Collection of lab specimens through heel sticks and arterial and venous punctures. Setup and management of therapeutic hypothermia blanket for infants with hypoxic-ischemic encephalopathy. 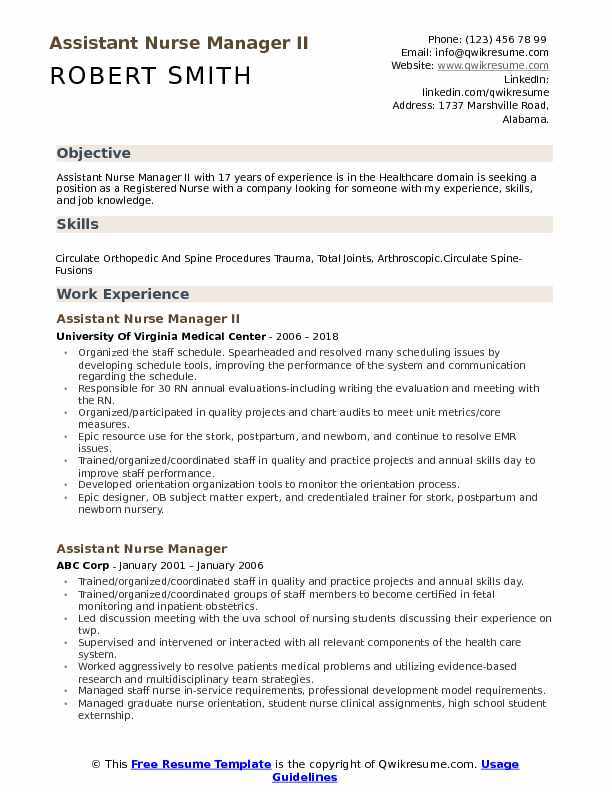 Summary : Assistant Nurse Manager with 9 plus years of experience is seeking to obtain a professional position as an RN that would allow me to utilize my advanced Nursing skills and provide high-quality care for the patients. For the 16-bed medical/cardiac intensive care unit. Assisting the nm on a variety of tasks, including staffing, scheduling, education, and training as well as interviewing new employees. Developing and writing a charge nurse resource guide for cleaning reusable medical equipment used in the unit. Interdisciplinary teamwork with NM and attending physicians to write and develop orientation materials for medical and cardiac residents and interns. Assisting in biweekly orientation with them. Collecting and managing the data for unit performance improvement measures and staffing methodology. An Active member of the clinical product evaluation committee, safe patient handling, falls, and education committees. Facilitating the MICU performance improvement committee and writing/maintaining the minutes for these meetings. Served as a leader in the initiation of unit daily safety huddle meetings. Serving as the resource person for computer and biomedical engineering issues for my unit. 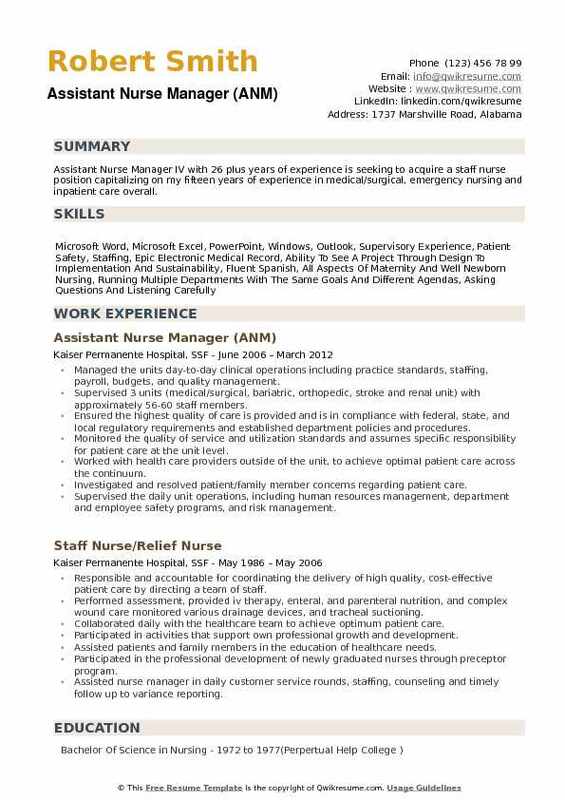 Summary : Sr. Assistant Nurse Manager with 7 plus years of experience in the Healthcare domain is seeking to render my unique experience, abilities and skills as a Registered Nurse to a Hospital that believes in 100% patient care and trusts its well-chosen staff to do an outstanding job at representing their objectives (mission) to the patients and their families. Managing the 10 bed, 6 triage bays, and 2 operating rooms in the labor and delivery unit with over 3,500 deliveries per year. Responsible for 25+ FTE direct reports to include registered nurses, obstetrical technicians, unit. Responsible for payroll/adjustments for both labor and delivery/mother-baby units. Responsible for the planning, organizing, directing, and empowering staff. Evaluation of patient satisfaction via leader rounds and other feedback mechanisms and facilitated. Responsible for acquisition, management, and development of qualified, competent staff necessary to provide high standard services in a cost-effective manner. Evaluating the department personnel performance i.e. Eappraise, direct observations, direct reporting. Participating in the quality improvement programs by analyzing needs and recommending and implementing changes. 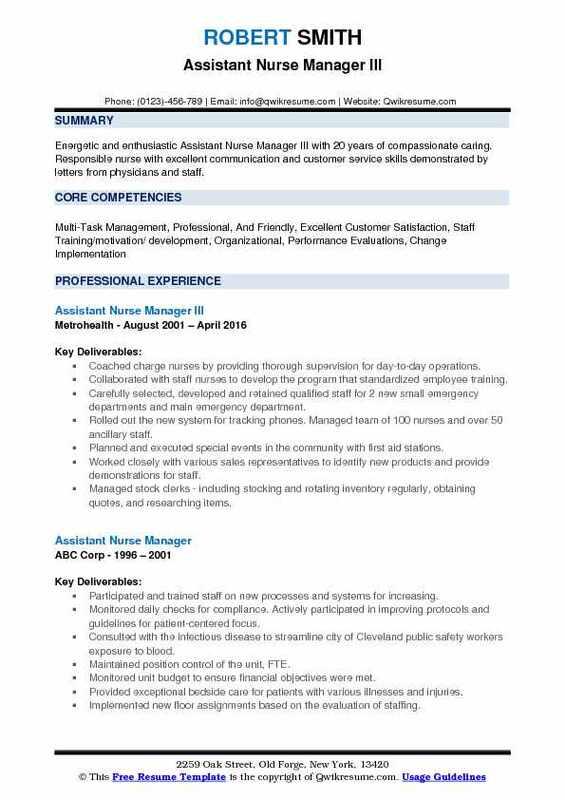 Responsible for the training of new assistant nurse managers/manager hires. 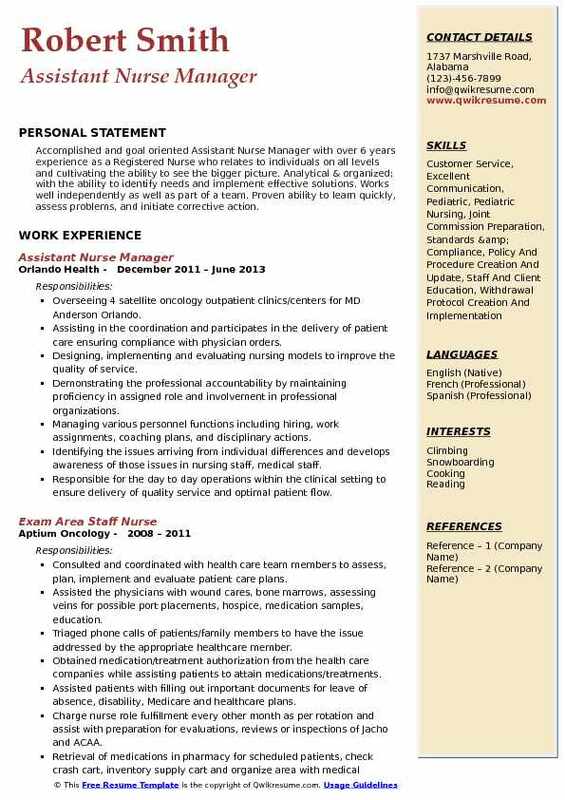 Headline : Accomplished and goal oriented Assistant Nurse Manager with over 6 years experience as a Registered Nurse who relates to individuals on all levels and cultivating the ability to see the bigger picture. Analytical & organized; with the ability to identify needs and implement effective solutions. Works well independently as well as part of a team. Proven ability to learn quickly, assess problems, and initiate corrective action. Overseeing 4 satellite oncology outpatient clinics/centers for MD Anderson Orlando. Assisting in the coordination and participates in the delivery of patient care ensuring compliance with physician orders. Designing, implementing and evaluating nursing models to improve the quality of service. Demonstrating the professional accountability by maintaining proficiency in assigned role and involvement in professional organizations. Managing various personnel functions including hiring, work assignments, coaching plans, and disciplinary actions. Identifying the issues arriving from individual differences and develops awareness of those issues in nursing staff, medical staff. Responsible for the day to day operations within the clinical setting to ensure delivery of quality service and optimal patient flow. Coordinating the staffing needs and reviews coverage on a daily basis to meet patient care requirements. Assisting in the clinical evaluation of team members completing written clinical performance evaluations and conducts timely team member assessments. Interfacing with patients and families to provide instruction, promote participation in patient care and to coordinate nursing activities. Monitoring the compliance with certifications, licenses and required education for team members. 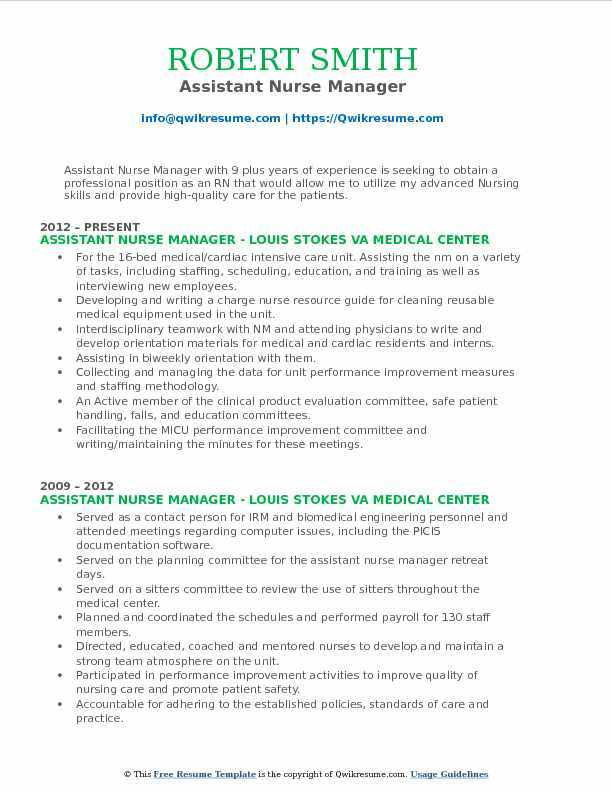 Summary : Assistant Nurse Manager IV with 26 plus years of experience is seeking to acquire a staff nurse position capitalizing on my fifteen years of experience in medical/surgical, emergency nursing and inpatient care overall. Managed the units day-to-day clinical operations including practice standards, staffing, payroll, budgets, and quality management. Supervised 3 units (medical/surgical, bariatric, orthopedic, stroke and renal unit) with approximately 56-60 staff members. Ensured the highest quality of care is provided and is in compliance with federal, state, and local regulatory requirements and established department policies and procedures. Monitored the quality of service and utilization standards and assumes specific responsibility for patient care at the unit level. Worked with health care providers outside of the unit, to achieve optimal patient care across the continuum. Investigated and resolved patient/family member concerns regarding patient care. Supervised the daily unit operations, including human resources management, department and employee safety programs, and risk management. Participated in hospital committees: nursing leadership, best practice council, and pharmacy committee. Assisted with coordination of orientation of new employees and students (scheduling, monitoring, and documentation of weekly progress). Assisted in the proper adherence to policy for falls monitoring which included staff counseling and adherence surveillance.